Read about the famous female volleyball players. Introducing a couple of stars from the world's top women's volleyball team of Cuba. 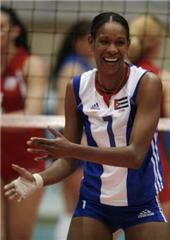 Yumilka Ruiz is one of the most impressive figures on the volleyball courts. If anybody ever has any doubts about women’s jumping ability, they should see this woman play. For sure she jumps much more than most men; Ruiz can fly! Yumilka Ruiz is considered one of the best players in the world; not only because of her jumping ability, but she is also a very skilled player and guaranteed to be on the best scorers or best spikers list during the tournaments. Captain of the Cuban women’s volleyball team, Yumilka Ruiz has been our long-time favorite player and would be our bias pick for the best player in the world award. Carrillo has an amazing jump serve and she is best known for causing lots of damage to opponent’s passing with her strong serving game. Strong offense and her powerful blocking make her nearly unbeatable player on her middle blocker’s position. Regardless of her young age (born Jan 11, 1986), she is already an experienced veteran. She has been playing at the world’s top level since she turned 16. She was selected the best server in the world’s championships in 2002 when she was 16 years old! What an amazing volleyball player Nancy Carrillo is, along with the teammate Ruiz she makes Cuban matches enjoyable to watch.